Hand made baby products aren’t just stylish, they’re also functional! These products have been made for centuries and have been passed down from generation to generation. 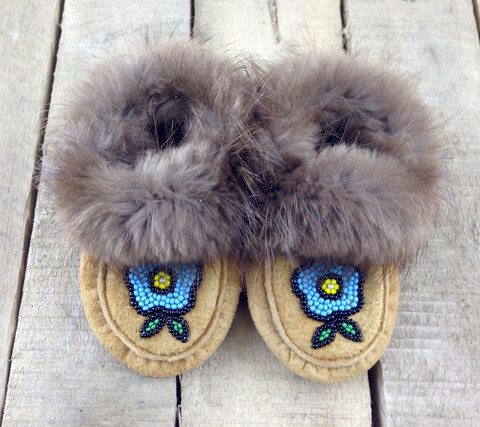 From tiny moccasins to baby carriers, check out all our baby products in our shop. The Cree, Ojibway and Dene peoples of Northern Region of Canada used materials from their environment for their everyday existence. Birch bark was used in almost all aspects of their lives. It was used for transportation, shelter, warmth, communication, utensils, storage, and in many other areas of their special events or teachings that would be passed on to future generations. Birch Bark is picked in the summer and fall months and it was stored and processed in the winter months. The birch tree decompose from the inside out, as environmental stewards harvesting birch was only done on fallen trees and or with great skill as to not harm the living tree. In order to preserve the bark it must be kept damp by wrapping with a wet cloth or soaking in water. 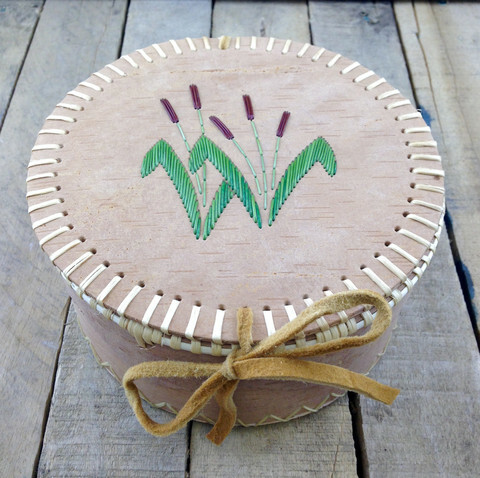 The art of birch bark biting would take place once the layers have been peeled to the thinnest layer, kept warm and pliable then folded several times and fits comfortably in the mouth. Once the bark is processed it is ready to be cut to shape. As with the Cree and Ojibway the winter months was a time to make lifestyle or traditional items because outdoor activities were limited due to the northern climate. Winter was a time to learn and many consider it the time when formal education took place. During these times of educating and learning art decorating the students would learn traditional meanings and practices. The Dene of northern Alberta and the NWT make similar birch products where available. We offer a wide variety of collectible merchandise. 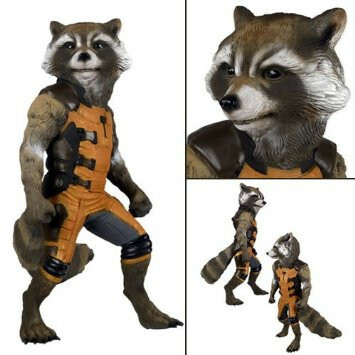 If you’re a geek at heart, make sure check out our always changing inventory or figurines and collectibles. We often stock rare and hard to find items and we sell top quality items with incredible detail. Fishing is part of the First Nation life style as long as we can remember. All the food is used, nothing is wasted. Every area has different types of fish; salmon, grayling, whitefish, trout, char, etc. The fish nation would always scale the fish to cook and eat. Rather than throwing the scales away or skinning the fish whole, the idea came to use the scales for something useful. At one time the whole fish was used for dog packs, bags, or decorating items on native crafts. The natural scale was used at the time as well as some natural dying processes.Today the scales can be dyed all different colors using Rit clothing dye. The use of dyes to make vibrant colors for pictures, birch baskets, clothing and many other decorations. The scales can be dyed on a stove using water/dye in the pot adding the amount of fish scales as needed. Rinse and dry on newspaper ready to use. Natural colors are just as beautiful also. Fish scale art is now being taught at potlatches, schools, festivals, art shows and cultural centres. First nations people would always give thanks for the fish providing food. 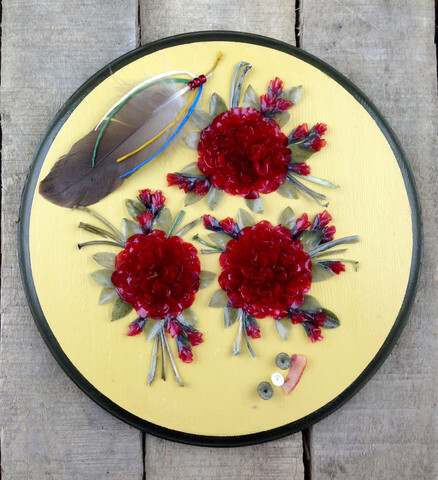 The art of hair tufting is done in the same style as moose hair tufting. 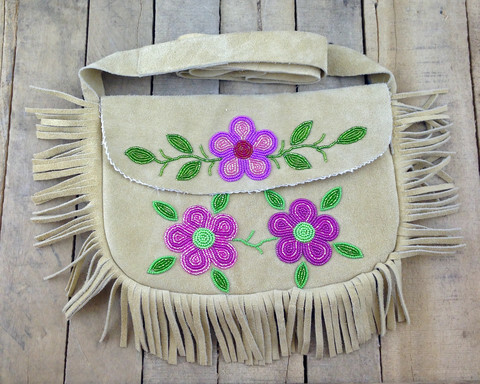 Moose hair tufting is a traditional form of decoration used by the western Athapaskan Indians, done on costumes and special items such as bags and belts. It is becoming more and more popular as it becomes better known. The caribou hair most suitable for tufting is winter hair as it is more white than summer hair and easier to dye. At one time it was dyed with with natural dyes such as berries,moss,bark and leaves. Now though, commercial dyes are used. After dyeing,the hair is dried and ready for sewing. 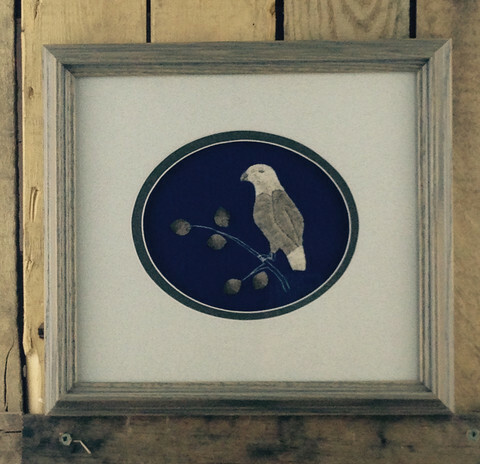 If a pattern is used,the picture is drawn onto the velvet or hide with a small stick dipped in flour and water. A small tuft of hair is held on a pattern,a stitch is made around the tuft and pulled tight with a special knot on the back of the velvet or hide. This makes the hair stand up in a tuft. The hair is then sculpted with small scissors. Because this method is used. No two tuftings are alike. Twyla was raised in Carmacks, Yukon. Her mother and father are of Cree and Chereky decent. Twyla was taught caribou tufting by one of her mentor’s Gladys Lavalee. 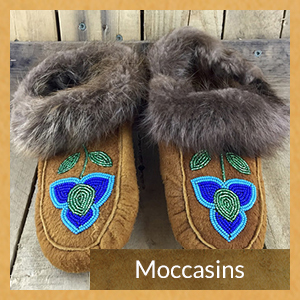 Moccasins are a native shoe traditionally made of deerskin, moose hide, buffalo hide, or other soft leathers. 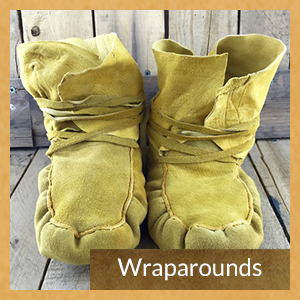 They are usually decorated with beaded patterns, decorative stitching and fur tufting around the ankles. 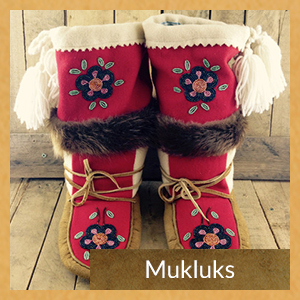 Mukluks are a larger boot version of this. They fully cover the ankle and are designed for cold winters. Traditional Moose Hide Tanning the Woods Cree way. Remembering to always give thanks for the food and materials the great moose has brought us. For more in depth information of this process please refer interested customers to watch the Youtube video done by the Portage College in conjunction with Elder Elsie Quintal of Lac La Biche, Alberta, Canada. We stock a variety of antiques and the selection is always changing. 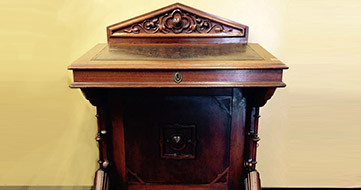 These antiques are quality products and are full of rich history. These pieces really tell a unique story that you won’t find anywhere else! Soapstone is a soft talc steatite, is a commonly used material in hand sculpted art. 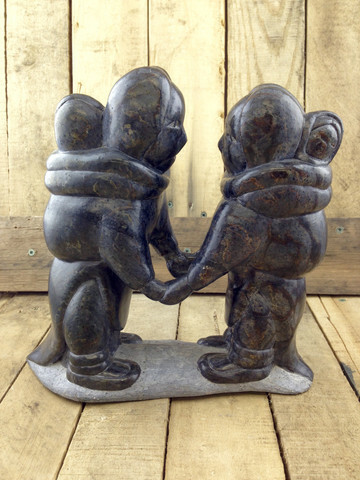 Soapstone sculptures date back to before contact with the Western world and were crafted entirely by hand. Today, these sculptures are still made by hand but occasionally power tools are used. With a chisel and a file, rock is chipped away to form a new shape. That shape is then wet-sanded with water and waterproof sandpaper for many hours until the soapstone is smooth and polished. Polished soapstone reveals beautiful colors previously hidden.